The Getty Center for the History of Art and the Humanities is dedicated to advanced research in the history of art. Their scholars ‘reexamine the meaning of art and artifacts within past and present cultures and reassess their importance within the full scope of the humanities and social sciences.’ To represent the notion of reassessment, I chose a piece from the Getty’s collection by Fluxus artist George Brecht that states This sentence is weightless in negative letterforms cut from aluminum sheets. Language has no physical weight, yet the meaning of words can have profound weight. The photo of a man facing the horizon (Western Avenue and Pico Boulevard, 1903) from J. Paul Getty’s personal scrapbook struck me as an historical moment full of hope and anticipating the future. The overall design emphasizes openness, which I believe to be an essential requisite for scholarly inquiry. 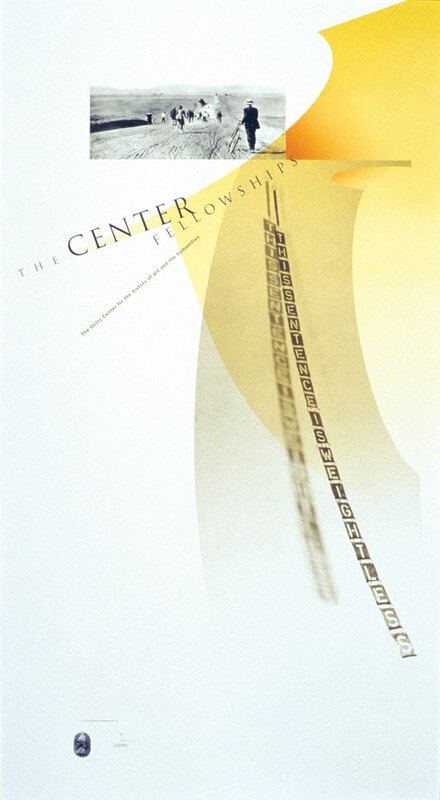 Julia Bloomfield contacted me to design the Getty Center Fellowship Poster. Do date, she is one of the most wonderful and respectful client relationships. She is brilliant. Photographers: John Kiffe (photography), Jobe Benjamin (printing). 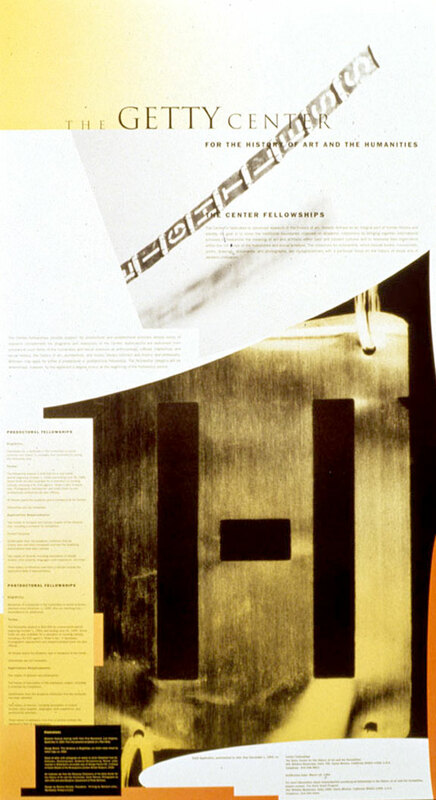 Poster for the Getty Center Fellowships, 1992. Front.